Staining concrete is becoming a popular home improvement option due to the number of color and style options available. Whether attempting to do it yourself or hiring a professional, there are virtually countless ways to improve your home using a concrete painting or staining method. But before you even so much as visit a paint store to start picking out paint, it's important to understand the process of staining concrete to help you determine the most effective products and methods. After all, the process does take some time, and one slip-up can sacrifice the integrity of the entire project. 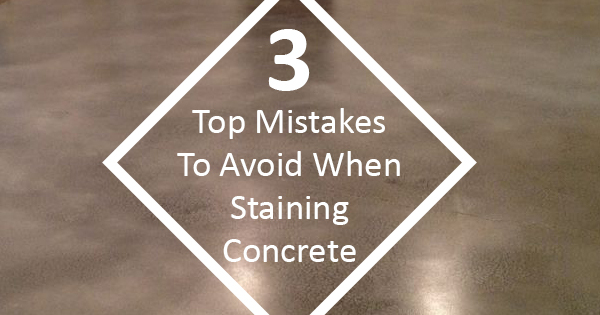 Here are just a few mistakes to avoid when staining concrete. Contamination of Surfaces Surface contamination is a common issue for those who don't know exactly how to look for it. But the truth is that there is a multitude of particularly stubborn stains, including wine, pet urine, and oil, that simply may not become visible until after you've started, or even finished, the entire concrete staining process. The solution is rather obvious, albeit difficult -- to access and remove the stain. Fortunately, once you access the stain, it can be removed easily, but getting to it can come with some difficulty. To avoid this issue entirely, experts recommend spraying the concrete with water before starting the staining process. As mentioned, many stains may initially be invisible, but water will temporarily darken the concrete surface and reveal their locations. This allows you to remove these stains and improve the quality of your concrete sealing application. Prolonged VOC Exposure VOC exposure is a growing threat to respiratory and cognitive health, yet a shocking number of homeowners still use traditional stains and paints containing the toxic compounds. If your flooring is more than one year old, many of the VOCs will have dissipated already. But if you're installing new flooring or painting your floor, go for an organic option and use VOC-free painting materials. Investing in eco-friendly stains and low VOC paints is investing in your and your family's health and future. Sealer Failure Finally, some homeowners staining concrete themselves experience a failure of their sealer. This typically occurs because the surface was not prepped properly or the stain was not applied correctly. If the spots are small, consider hiding them with spray paint. For larger spots, an entire reseal may be warranted. Ultimately, understanding the concrete staining process is the key to ensuring your satisfaction with the results. For more information about eco-friendly stains, contact Ecos Paints.